The TreePot is a unique cedar decorative planter which allows you to place bedding plants close to the tree without damaging the tree. It is available in different sizes to fit around various tree trunks. The TreePot gives the appearance that the tree is growing out of the planter. In reality, the planter rests on top of the ground with an interior shelf that can hold up to ten inches of potting soil. With the planter around it, the tree and the bedding plants are protected from dangers such as weed eaters. 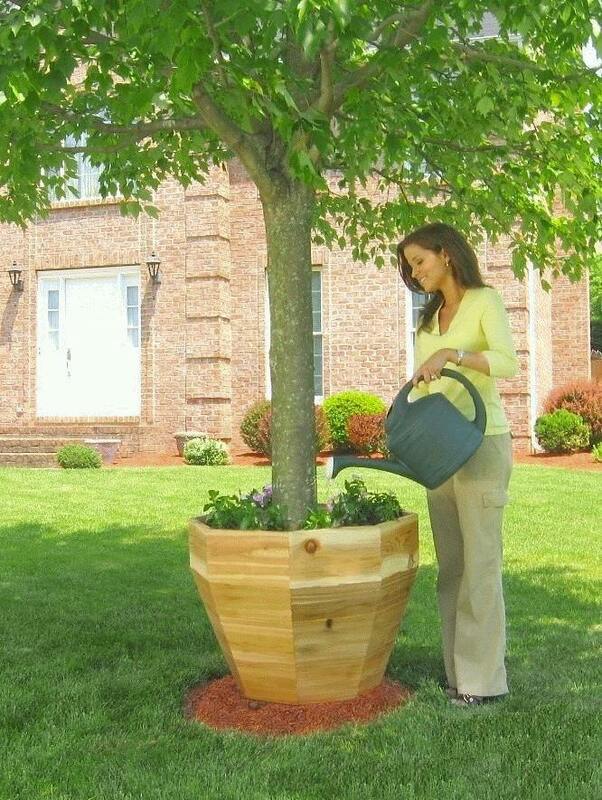 The design of the TreePot allows you to place it around a tree in minutes. It is made of cedar, which is very durable and lightweight. Cedar also acts as a thermal coefficient, which means that even in the middle of summer, your bedding plants remain cool in their own soil. This beautiful wooden planter instantly transforms any area from boring to spectacular and gives a wonderful finished touch to your space. Because of its beauty and thoughtful design, the TreePot is a must-have addition for your yard or business.